Law is used to mean the rules made by the government to protect the fundamental rights of the citizens. Non-compliance or violation of the law can lead to punishment such as imprisonment or penalty. Laws are classified into two groups procedural law and substantive law, wherein the Procedural law administers the operation of a particular case, by conforming to the step by step process through which the case passes. On the contrary, the substantive law can be defined as one that comprises of statutory rules passed by the legislature, through the process of enactment, regulating the conduct of citizens. It talks about the structure and facts of the lawsuit. The article presented to you simplifies the difference between procedural law and substantive law, so take a read. Meaning Procedural law is a law that specifies the practice, procedure and machinery for the imposition of rights and duties. Substantive Law is the law that states the rights and obligations of the parties concerned. Governs How legal case flows? How people should behave? Concerned with Ways and means for imposing substantive law. Fixation of rights and duties of the citizens. Governance By statutory law. By act of parliament. Defines Initiation and prosecution of civil and criminal lawsuits. Rights of parties and punishment for wrongdoer. The procedural law can be defined as the law which governs the way in which court proceedings are undertaken. Simply put, it explains the methods and practices, that are followed in the court for a case, i.e. the gradual phases of the lawsuit that will take place and the way in which case is managed in the court. So, it describes the series of steps taken in civil, criminal and administrative cases. As procedural law determines the procedure of all lawsuits, it complies with the due process. Due process pertains to the person’s legitimate right to have legal proceedings if he/she is sued. The procedural law determines the means of imposing rights and providing remedies to wrong. It consists of rules concerning jurisdiction, pleading, appealing, presenting evidence, executing judgement, cost and the like. Substantive law is used to mean the written law that states the rights, duties and liabilities of the citizens and collective bodies. It is the system of rules that regulate the behaviour of the citizens of the country. It is generally codified in statutes but can also be found in common law. Substantive law is concerned with the substance of the case. It either helps in suing someone or defending a person from legal proceedings. 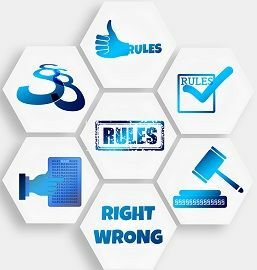 It is that part of the legal system which differentiates between right and wrong conduct and personifies the idea that committing the crime will lead to penalty or punishment or both (as the case may be) to the wrongdoer. By procedural law, we mean the law that prescribes the methods, procedure and machinery for the enforcement of rights and obligations. On the other extreme, substantive law alludes to the law that deals with the subject matter of the case and states the rights and obligations of the parties concerned. While procedural law determines the manner in which the case is filed or appeal is made, the substantive law regulates the conduct of the individual or government agency. The procedural law creates the mechanism for the enforcement of the law. Unlike substantive law, which states the rights and obligations of the citizens. The procedural law applies to both legal and non-legal matters. Conversely, the substantive law cannot be applied to non-legal matters. The statutory law regulates the procedural law, whereas substantive law is governed by the act of parliament. The procedural law is all about the initiation and prosecution of civil and criminal proceedings. As against, the substantive law pertains to the rights and duties of parties concerned and punishment for the wrongdoer. The procedural law deals with the affairs inside the court like appealing, presenting evidence, representation of counsel, pleading, reviewing etc. Unlike, substantive law which is concerned with matters outside the court, like fundamental rights and liabilities of the members of the society. Simply put, the two types of law differ in the sense that procedural law oversees the litigation process of the case, whereas the substantive law deals with the objective and subject matter of the litigation. While procedural law expresses how the law is implemented, substantive law explains the forbidding and mandating conducts as per law. In short procedural law, is nothing but an add-on of substantive law.